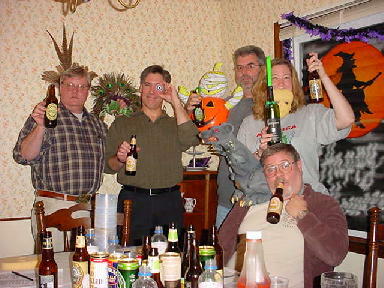 Owen Ogletree (director of Brewtopia Events) gathered together some of his fellow beer lovers on Halloween night of 2001 to sample and comment on several English-style ales available in Georgia through Thunderhead Distribution wholesale beer distributor. This beer sampling was done as a blind tasting where each style was revealed, but no one was aware of the brands that were being served. Beers were informally commented upon and ranked according to American Homebrewers Association (AHA) style guidelines. First, second, third place, and honorable mention were awarded to the beers we felt represented their styles in extraordinary fashion. Drop Owen an email to share your comments and opinions. These great ales warmed us up on a cool Halloween night. (L to R): Lari Cowgill, Don Beistle, Dean Graves, Larry Johnson (with rat on shoulder and bottle in mouth), and Kerri Allen (Owen Ogletree took the picture). We'd like to thank Thunderhead Distribution for supplying these fine ales! Aroma: Malt, butterscotch, toffee, caramel, winey characteristics -- beautiful and complex. Flavor: Almost reminiscent of a Barley Wine. Burnt notes, slightly roasty, rich, complex, a crystal malt flavor. No (or very little) smoke flavor. Incredible beer! Aroma: Fresh coffee grounds, licorice, anise. Appearance: Black with a creamy head. Flavor: Very impressive with notes of coffee, roast, licorice, cherries, espresso. Medium sweet with dark grain flavor prominent. Very rich and complex, yet balanced. Smooth mouthfeel from the use of oats. Aroma: Delicate roast malt aroma with hints of currant, licorice, and chocolate. Appearance: Very dark. Head is pretty good. Flavor: Chocolate-like dryness with a complex flavor. Mouthfeel is thick and oily (in a good way). Medium-full bodied with somewhat low carbonation. This beer is sweet, chocolatey, and a bit fruity. Flavor is not too roasty. This is a delicious, rich beer that would be great with a chocolate dessert! Aroma: Slight malt with hints of hops and citrus. Flavor: Malty, slightly nutty, raisin, hops (balanced well with malt). Mouthfeel is light with hints of crystal malts. Hops have a citrus, resin-like American character. This is a wonderfully smooth session beer that has a hop character that could be a bit high for the Mild style. Aroma: Clean with just a hint of apples. Appearance: Pale yellow and clear. Carbonation is very light. Flavor: Dry, a bit tart with a good balance of apples and tartness. Flavor is crisp and light. Alcohol is not very noticeable. A refreshing cider. Aroma: Smells nice and dry-hopped. There is a bit of hop aroma. Appearance: Creamy head. Medium copper. Flavor: Hint of crystal malt, creamy pub draft can mouthfeel, not very bitter. Very light in body and flavor (even for his light style of ale). Low alcohol and very smooth. This is a light, smooth, refreshing ale. Appearance: Medium gold with a creamy head. Flavor: Malt, vanilla, tea, English hops, caramel. This ale is well-balanced with pleasant, subtle flavors. The body is light to light/medium. This is NOT a powerful India Pale Ale as the can says, but more of an Ordinary Bitter. A tasty session beer to go along with good conversation. Aroma: Fruity with butterscotch notes. Malt. Appearance: Copper color with a creamy head. Flavor: Malt flavors are evident with crystal/caramel specialty grains. Hop flavor and bitterness low. Complex fruitiness is apparent with a tiny hint of solvent-like character. Medium body with creamy texture. A very pleasant ale. Appearance: Amber with a creamy head. Flavor: Light malt with a creamy mouthfeel. Low carbonation, caramel flavors, faint fruity esters. This ale has a smoke-like character from the use of some peated smoked malt (well balanced). There is light diacetyl (butterscotch). This is a quite desirable Scottish Ale with a light/medium body. Aroma: Malt with hints of banana-like phenols. Very light aroma. Appearance: Copper colored and clear. Flavor: Hops, malt, quite bitter. The hops have a resin-like quality from the use of American hop varieties. This is a simple Bitter that is not very rich or complex -- very pleasant. Aroma: Malty with mild roastiness. Hop aroma is low. Flavor: Some tasters reported the presence of "smoke" -- some did not. There is a slight sharpness from the dark grains. This is a substantial dark ale that is quite delicious. Bitter/sweet chocolate character is there in the aftertaste.